When truck drivers are on the road, often far from home and from their home base of operations, they often need to procure essential supplies such as fuel, and pay governmental fees , such as scale fees. In addition, emergencies occur with some regularity. When these things happen on the road, truck drivers need an efficient, reliable form of payment for the goods, services and fees. Moreover, this payment method must be tied to the carrier or trucking company, not to the truck driver’s own personal funds, since these expenses are incurred in the ordinary course of the trucking company’s business. One common way that truck drivers manage such expenses is through an EFS check. What Is an EFS Check? EFS is a commonly used abbreviation for a business named Electronic Funds Source, LLC. 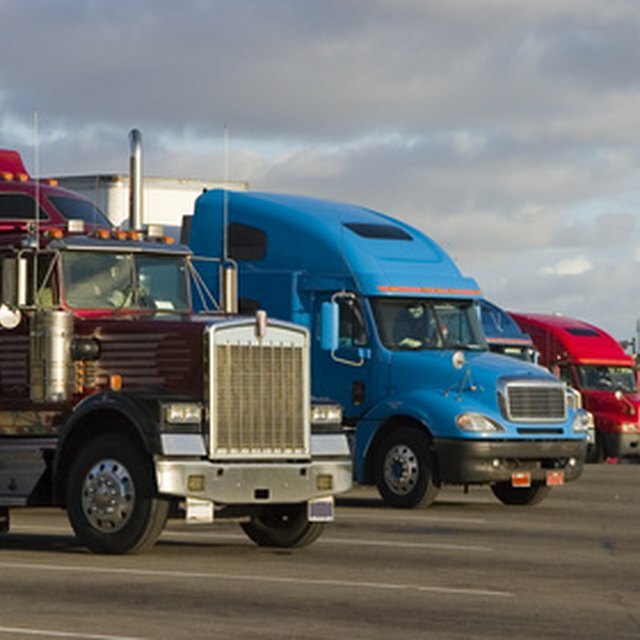 This company, among other business functions, provides a service allowing trucking companies and transportation brokers to provide a mechanism for their drivers to pay for necessities while on the road by issuing EFS checks to them. An EFS check is a paper draft, similar in appearance and function to a personal check. This slip of paper is preprinted with labels and blanks for various fields, including the date, the company or person to whom payment is being made and the amount. The draft also includes fields for three tracking identification numbers: the issuer number, transaction number and authorization number. Prior to making a purchase, the driver must contact the trucking company to specify the transaction amount for the purchase in question. The trucking company, in turn, gives the driver its issuer number and a transaction number. The authorization number comes from EFS and is usually obtained by the merchant or vendor (or agency, in the case of a fee). What Do I Need to Start a Trucking Business? What Is a TCH Check? In the past, TCH checks worked in much the same way, permitting fast transfers of funds for emergencies or other on-the-road needs. TCH checks worked similarly to personal or business checks and transferred funds directly out of the carrier’s account. They were widely accepted across the U.S., making them a popular method for covering essentials and emergencies for truck drivers on the road. In 2011, the Transportation Clearinghouse (TCH) merged with EFS, so that now the term EFS check applies. Fuel purchases account for a large chunk of trucking companies’ expenses. What’s more, given the volatility in fuel prices, it’s more difficult for these companies to budget and control expenses. While some of the larger companies in the trucking industry will pursue a long-term relationship with fuel providers, this approach only goes so far towards controlling costs. It generally locks the trucking company into a price that may be higher than the current average, depending on the time of year. And in many cases, a contract with a fuel provider won’t do any good to a trucker who needs fuel in the middle of the night, with no available locations for that particular fuel company in sight. This means that fuel company-issued cards do not work as a long-term, exclusive payment mechanism for most truck drivers. As a result, EFS checks are used by many companies to permit their drivers to make necessary purchases while they’re on the road. Generally, the company will issue blank EFS checks to the truck driver. Alternatively, the truck driver may obtain them at various businesses such as truck stops, repair garages and even some general merchandise stores. Finally, truck drivers may call EFS customer service to find nearby locations of businesses who can provide the checks to them. For truck drivers, EFS checks are a convenient way to buy the essential goods and services, as well as pay mandatory fees while they’re working. For the trucking companies who employ the drivers, the EFS check is an efficient way to track and manage driver expenses. Because each purchase must be accounted for with transaction numbers and authorization numbers, the company can keep tabs on how much is being spent and for what purposes. For transportation-related companies, such as truck stops, tow companies and gas stations, accepting EFS checks means good customer service to a large segment of their customer bases. However, some vendors have been targeted by scams involving EFS products in the past and may be understandably cautious about accepting EFS checks without adequate safeguards in place. Annie Sisk is a freelance writer who lives in upstate New York. She holds a B.A. in Speech from Catawba College and a J.D. from USC. She has written extensively for publications and websites in the business, management and legal fields.